How to be a world class financial analyst. Do you want to be a world-class financial analyst? Are you looking to learn industry-leading best practices and stand out from the crowd? If so, then this is the ultimate guide for you on how to become the best analyst you can be. 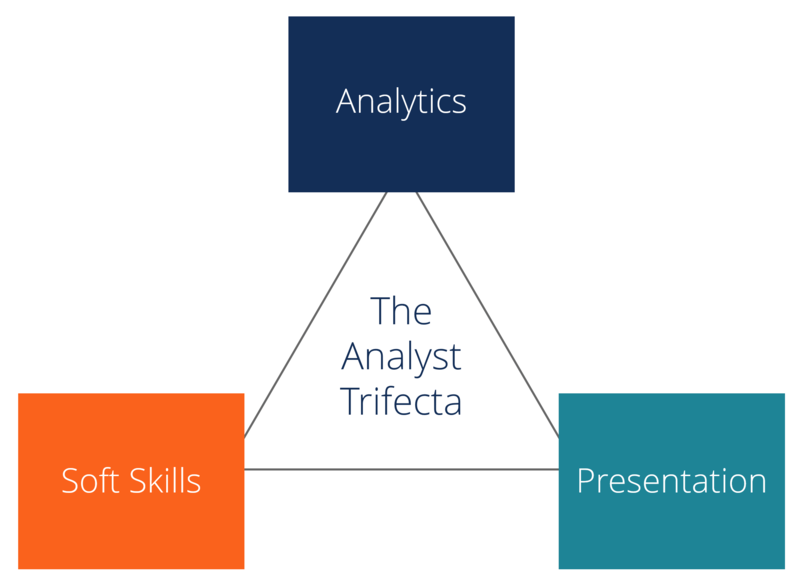 Our approach is called The Analyst Trifecta®. All three of these are required to rise to the top, and will henceforth be referred to as The Analyst Trifecta®. This guide will help you succeed in most of the jobs on our Career Map. Check out our career map to see what job fits you the best! A world-class financial analyst lives and breathes numbers, calculations, and interpretations. They know how to distill vast amounts of data into a simple and easily digestible format. They have unwavering attention to detail, and dream in numbers. The best analysts know how to collect, organize, analyze, and interpret data. Each of these four steps are equally important and form the bedrock on which their career is built. Collecting data is the logical first step. It may sound simple, but it’s important to know where to go for information, and how to get it. We have provided a list of financial data sourcesFinancial DataWhere to find data for financial analysts - Bloomberg, CapitalIQ, PitchBook, EDGAR, SEDAR and more sources of financial data for financial analysts online on our website where financial analysts typically begin their search. However, knowing these sources is not all there is to collecting data. It is the specific reports and sections of these reports that are most important. For example, a basic analyst will know to pull a company’s 10-K report from Bloomberg, but an advanced analyst will know exactly which notes to flip to and what parts of the MD&A (Management Discussion & Analysis) provide the most information. Organizing data in a clean structure is critical. You may have hit the “jackpot” with a large data dump, but if it’s not well organized then the analysis that’s built on top of it will be a disaster to audit. Confidence in the results will be diminished. It’s important to plan your financial modelingWhat is Financial ModelingFinancial modeling is performed in Excel to forecast a company's financial performance. Overview of what is financial modeling, how & why to build a model. A 3 statement model links income statement, balance sheet, and cash flow statement. More advanced types of financial models are built for valuation, plannnig, and with a logical framework and structure the data with a long-term view of what the final product will look like. This is particularly important in financial modeling, where best practices on structuring are what separate the good analysts from the great. Check out our complete financial modeling guideFree Financial Modeling GuideThis financial modeling guide covers Excel tips and best practices on assumptions, drivers, forecasting, linking the three statements, DCF analysis, Excel modeling and much more. Designed to be the best free modeling guide for analysts by using examples and step by step instructions. Investment banking, FP&A, research to learn more. Analyzing the data is what we typically think of as the main job of an analyst – hence the name. At this stage, it’s time to start calculating metrics and ratios (e.g. EV/EBITDAEBITDA MultipleThe EBITDA multiple is a financial ratio that compares a company's Enterprise Value to its annual EBITDA. This multiple is used to determine the value of a company and compare it to the value of other, similar businesses. A company's EBITDA multiple provides a normalized ratio for differences in capital structure,), rates of return (e.g. ROAReturn on Assets & ROA FormulaReturn on assets (ROA), a form of return on investment, measures the profitability of a business in relation to its total assets. The ROA formula is used to indicate how well a company is performing by comparing the profit it's generating to the capital it's invested in assets. The higher the return, the more), risks, accretion/dilution, and IRRInternal Rate of Return (IRR)The Internal Rate of Return (IRR) is the discount rate that sets the net present value of an investment equal to zero. This guide to calculating IRR will give several examples and who why it's used in capital budgeting, private equity and other areas of finance and investing. If IRR is greater than cost of capital,. This is where sharp accounting and finance skills come in handy and many analysts take the opportunity to showcase their skills by analyzing information in the most insightful and intuitive way. It’s also where the analyst can start to have some direct impact over the story that’s being told with the data, whether that’s confirming a thesis, supporting a client’s agenda, or getting to the “truth”. Interpretation is where world-class financial analysts shine and show off their skills at making recommendations. This is where we reach the “so what?” part of the analysis, and it’s time to suggest some specific action items. A great analyst knows they have to be careful here – this is the bridge between where their job ends and executives take over. It’s important to provide insightful suggestions, but typically not wise to push an agenda or an extreme view. With that said, objective advice will hopefully prevail in the long run. In order to help you reach this level, we’ve designed an extensive online training program. This is much less talked about than analytics, but is still incredibly important. A significant portion of an analyst’s work is creating compelling presentations (e.g. investment banking pitch booksInvestment Banking Pitch BookHow to make an investment banking pitch book. This guide will teach you what's included, how to make an IB pitch book, and provides examples of slides), documents, memos (e.g. greensheetsGreensheetA Greensheet is a summary of the key attributes of the issuer of an offered security used by the sales force when they solicit expressions of interest from), and other forms of internal or external communication. It’s absolutely critical that these documents be well written, visually appealing, and persuasive. The two main aspects of communication that we will build on in this guide are written and visual communication. Written communication skills can make or break an analyst. Even though most of your efforts (on a time basis) will be spent performing quantitative analysis, it’s the expression of your findings that matters most. What constitutes good written communication for a world-class financial analyst? Strong written communication comes down to an analysts structure, argument, and supporting points. It’s important to isolate the central argument and hammer that point home with relevant supporting information. It takes practice, but there is a knack to writing persuasive business documents that an analyst should strive to develop over time. Take a look at our templates for a letter of intentLetter of Intent (LOI)Download CFI's Letter of Intent (LOI) template. An LOI outlines the terms & agreements of a transaction before the final documents are signed. The main points that are typically included in a letter of intent include: transaction overview and structure, timeline, due diligence, confidentiality, exclusivity or a term sheetTerm Sheet TemplateDownload our term sheet template example. A term sheet outlines the basic terms and conditions under of an investment opportunity and nonbinding agreement for some examples of good written communication. Visual representation of data is at the center of good financial analysis. It’s important to create charts and graphs that make the information easy to follow, with clear takeaways, and a feeling of confidence. This is an area where CFI can help, as we have designed several courses that walk you through the process of building beautiful Excel outputs, step by step. Our advanced excel and data visualization courses include lessons on building various types of charts for pitch books, research reports, or other documents. This part of the trifecta is absolutely critical but often receives the least training, development, or focus. It’s easy to focus on financial modeling training but that won’t be enough to stand out. The areas of soft skills that a world-class financial analyst needs to work on are communication, politics, and personal branding. Oral communication is probably the least practiced and leased focused-on subset of communication but it’s very important for financial analysts. To rise in the ranks, you have to be able to hold your own on a conference call with a client or with an executive and communicate your thoughts in an effective way. Good communication requires confidence, awareness, and the ability to read other people. If you can read them, there’s hope of adjusting your approach based on the non-verbal feedback they give you. Politics can be a dirty word and many people prefer not to talk about it or pretend it doesn’t exist in their organization. The fact is, as soon as you have two or more people working together, there is potential for politics. The suggestion here is not to become a highly political person, it’s simply to be aware of the politics in your organization and to have a plan to manage politics. Analysts frequently make decisions with no regard for the political implications and that can backfire. Conversely, those who are able to navigate the system seem to rise more quickly. 1) You understand the politics of your organization. 2) You make a strategy about how to successfully navigate the politics in your organization. 3) You constantly check in with yourself to stay grounded. Managing your personal brand can mean several things. At its core, it means conducting yourself in a manner that causes colleagues and clients to respect you, enjoy working with you, and view you as a high achiever. This is easier said than done as it takes a lifetime of good decisions to build a strong personal brand. It only takes one bad decision to destroy it. 1) Always have a positive attitude. 2) Work well with teammates and don’t create drama. 3) Always follow through on what you promise to do and operate with the highest level of integrity. How to get hired as an analystGuide to Becoming a Financial AnalystHow to become a financial analyst. Follow CFI's guide on becoming a financial analyst - networking, resume, interviews, financial modeling skills and more. We've seen thousands of people become financial analysts over the years and know precisely what it takes.